We will be discussing "The Missing Three-Quarter" at our meeting on Tuesday, March 7th. See the previous post for details. 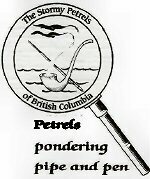 Due to the unpredictable weather situation in the Vancouver area, the Stormy Petrel meeting scheduled for Tuesday, Feb. 7th has been cancelled. We will meet to discuss "The Missing Three-Quarter" on the first Tuesday in March.